We've seen VR used to do everything from watching films on a cinema-sized screen to helping surgeons performing medical procedures, but what about making an impact on one of the biggest industries in the world - health and fitness? One French VR company think it has the answer - the Holodia. Shown off at Computex 2016, the idea is to make those boring trips to the gym (or a session at home on your personal rowing machine or elliptical trainer) a bit more interesting by transporting you to another world or setting. The startup has used a number of different over the years, including Samsung's Gear VR. The setup showcased at Computex used a HTC Vive and a Concept 2 rowing machine (the kind you'd most likely find in a gym), which is hooked up to a specially-designed PC called a Holofit computer. 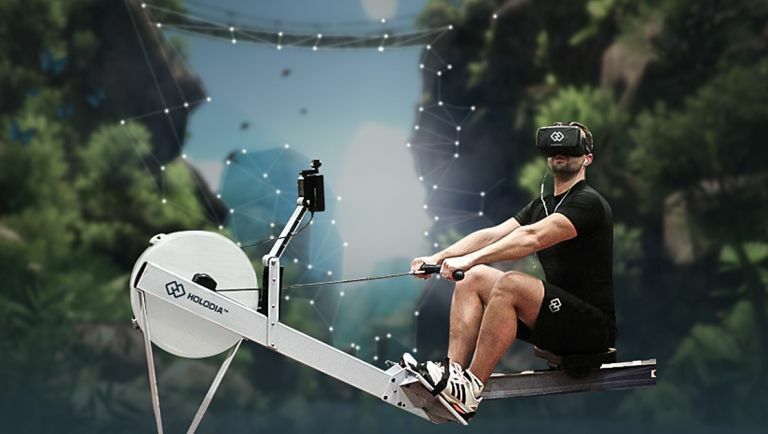 The data from the rower is connected to the PC and is shared with the program sent direct to your VR headset - so, for instance, you could be rowing your way down an Amazonian river while tracking your performance on a handy screen like you would in real life. If the idea of having a proper VR fitness setup in your home appeals, then you're in luck - you can pre-order a Holodia rower setup today, but it will cost you. The rower pack (which includes the Concept 2 rowing machine, a HTC Vive, the Holofit PC and all the necessary wires) will cost US$12,131 (£8,388) with an early bird discount. The regular price will be around the US$13,500 mark (£9.336).